Nathan P. Gilmour , 17 September 2014. Recently an intrepid group of students and faculty at Emmanuel College began a school-year-long adventure in philosophy, planning together to read Wittgenstein’s Philosophical Investigations together, a bit at a time, over the fall and spring semesters. As we got the group rolling, I volunteered to provide some sort of online catch-up for those who couldn’t make this or that meeting. This series of blog posts will attempt to do that. If you ever want to find out whether an English-speaking friend of yours has read this book, send her a one-word (and punctuation mark) email reading simply “Slab!” If your friend assumes your account has been compromised, then likely he hasn’t read the book. If your friend asks when you read Wittgenstein, she might just have read this book. The opening sections of Philosophical Investigations (parenthetical notations in the following refer to sections, not to pages) inquire into the nature of language, starting first with the common conception that words and things correspond on some level, with the word “apple” corresponding to a particular sort of fruit and the word “red” corresponding to this color but not that one (1). 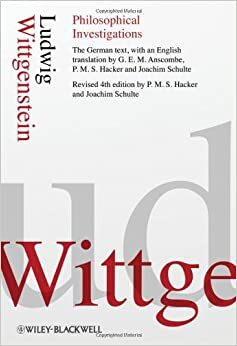 But by means of a series of thought-experiments, Wittgenstein begins to show that such a view of language misses some of the most basic ways in which language does work. The earliest thought-experiment asks a reader to imagine a language in which those who know the language use the words “block,” “pillar,” “slab,” and “beam” to help them build something together. When one calls out “Slab!,” the other brings along the slab, and so on (2). For the sake of thinking differently about how language works, he proposes thinking about them not as neat, orderly systems but as clusters of games. So in one game, “Slab!” is a command to bring a certain sort of building material from there to here, whereas in another, “Slab!” is the name of an object, a word but not a thing, to be discussed by a philosophy seminar. How those games connect to each other isn’t yet the concern of the book, but Wittgenstein offers an early metaphor of the same, comparing language to the growth of a metropolis, complete with orderly suburbs, from the core of an old city, whose inner streets twist and a turn with a logic lost to time (18). As I read it, one of the early theses of the book is that “to imagine a language means to imagine a form of life” (19). Thus language is neither limited nor unlimited because human existence is neither limited nor unlimited. Before the invention of baseball, to talk about baseball was unintelligible, but that doesn’t mean that the addition of baseball-talk makes language anarchic; instead, it’s intelligibly historical. The “Slab!” language (yes, by the end of the first session of Wittgenstein Wednesdays, our whole group found the word “slab” utterly hysterical) derives its intelligibility from the human practice of building things with beams and blocks and slabs, and talking about double-plays and the infield fly rule is gibberish in an imagined context in which folks don’t play baseball. The philosopher of language does well not to say too early (which is to say at all) that the limits of language are already drawn, but the skeptic of linguistics does well to note that, when talking to baseball fans, “designated hitter” does not mean whatever the speaker wants it to: it’s intelligible as evil because it’s part of the discourse of baseball, but that doesn’t change the fact that it’s evil. As I write this, I know full well I need to leave this segment of Philosophical Investigations (which we discussed two weeks ago) and turn to sections 26-52 (which I’ve read but need to review now). More on that in the next few days.